Think of Mezcal as Tequila's smokey father. 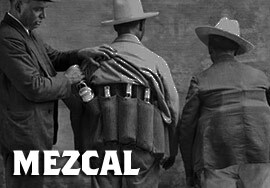 Mezcal is made from the heart of the Maguey cactus and generally hails from Oaxaca, Mexico. The distillate is commonly more smokey than Tequila and generally produced by very small distillerias as opposed to the large tequila producers. Mezcal is typically drunk neat as opposed to being used as an ingredient in cocktails.